Allows counselors to capture individual patient data, implement a personal plan for each patient, track progress, schedule appointments and use the data for further research. Uses the evidence based approach adopted by the leaders in tobacco cessation research and treatment. Captures and uses the data recommended by the Center for Disease control and the Public Health Service Guidelines. 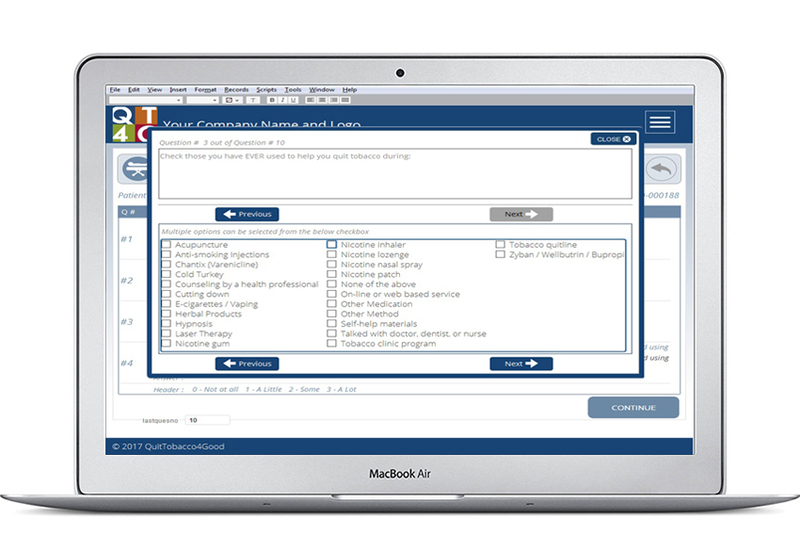 Our software is used by doctors, clinics and hospitals to help patients quit tobacco for good. Give your patients the best chance for success with QT4Good! Our software enables you to treat, educate and provide your clients with the best opportunity to successfully quit tobacco – for good! QT4Good main switchboard, allows you to add your company information in Settings. 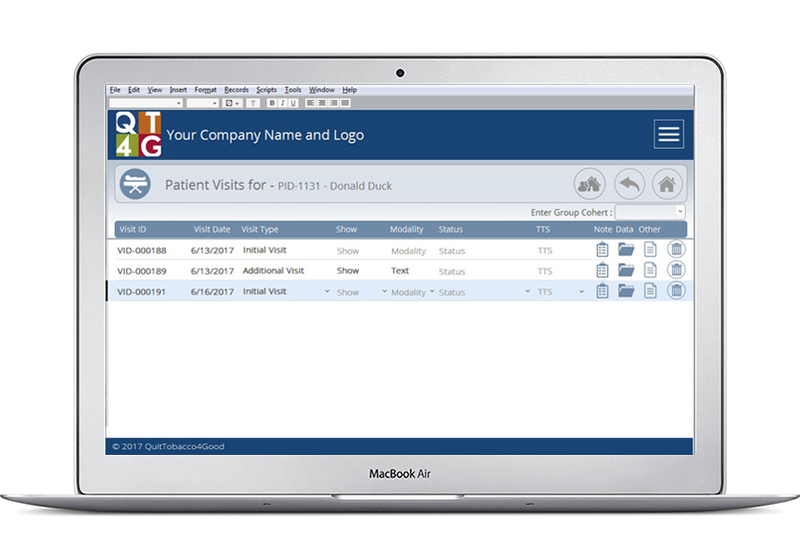 You can easily manage Appointments, Patients, Groups by the click of the button. The Admin and Report menu allow you to see instant results in the data you have entered into the program. Following the ACT Center guidelines, the patients first visit will be an Intake session, to help determine the best program for the patient. There are 9 sections of data and the iPad makes this process easy for the Patient to enter data, that is synced with the main database. The interventionists can see the results instantly. This is an example one of the data entry screens for Section F, Tobacco History. The patient or Counselor can easily move through these screens using the buttons or the arrow keys, saving time and getting faster results for the patients. The Patient Visit screen shows each visit, date and type of visit in descending order. You can click on the Note button to get an instant report for that visit or you can click on the Data button and go into each Section of data they filled out for that visit. Other allows you to type in other Notes for that Patient. We are a small transportation company that needed to fully integrate a scheduling system for our clients and drivers. Customized Computer Solutions’ work on our database fully integrated our systems and has completely transformed our business. In the past, we used many different programs to fulfill our needs as a transportation company and CCS was able to create a well-organized solution that not only allowed our dispatchers to effortlessly communicate with our drivers with a click of a button but also gave us the ability to smoothly and quickly prepare for daily pickups and returns with our clients. 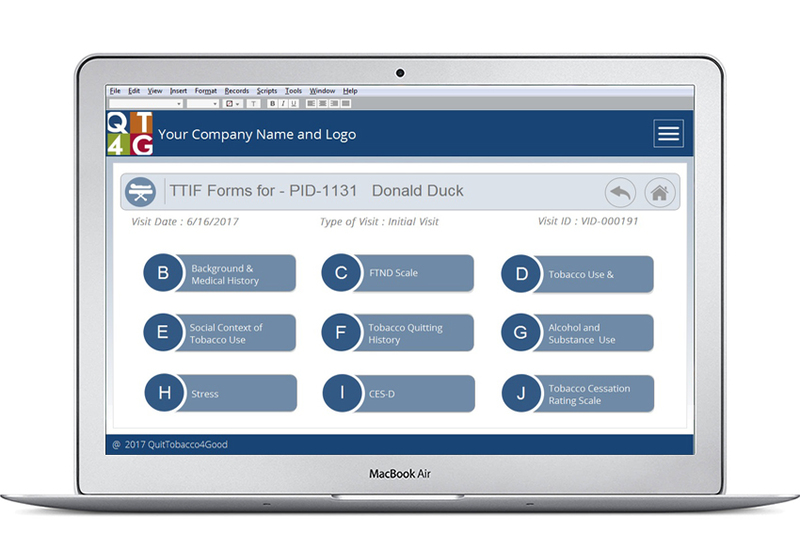 The drivers use FileMaker Go on their iPhones to instantly report back to the dispatch using FileMaker Server, the pickup and delivery information, making this a real-time application. Customized Computer Solutions listened to our needs and created a database that exceeded our expectations. I have had the pleasure of working with Customized Computer Solutions in my former role at Blue Cross & Blue Shield of Mississippi as Team Lead, Network Services, and Network Administrator. CCS had the role of Database support and development. Anytime there was an issue it was met with prompt and reliable assistance from Joanne and her team. All issues were resolved in record time with little down time. Joanne and Conrad are also a joy to work with – very knowledgeable and professional. Sheldon Laboratory Systems designs and manufactures the most innovative and durable lab furnishings available for elementary, middle school, high school and college laboratories. Sheldon prides itself on a series of quality programs and processes including careful inspection of every cabinet during each phase of production. This effort is supported by a FileMaker database using FileMaker GO and iPods to scan, identify and track units throughout the manufacturing process. Real time reporting generated by the database assist in identifying bottlenecks, providing status updates as well as photographic documentation and time stamps for products all while decreasing processing time and increasing efficiency. With this help of FileMaker and the custom program designed by CCS, Sheldon Labs is able to ensure each and every project is delivered on time and complete. Using FileMaker Go and the iPads, the medics track patient data. By going to this ePCR and reporting to MEMSIS, we are state compliant with our reporting. The ePCR has also helped with our billing times reducing them to days and not weeks. Using FileMaker Go and the iPads, the medics track patient data. At any time, we can call CCS and have the system checked to see what is causing a hiccup. CCS has gone out of their way to work on getting the best fix to any challenge or required change that occurs. *$20 for up to 15 users/devices. iPad module available one time fee of $200. * Minimum monthly charge of $100. *$20 for up to 10 users/devices, $15 for 10+ users/devices. *Minimum monthly charge of $200. Customized Computer Solutions, LLC is a software development company, started by Joanne Bell. Joanne is a gifted programmer who loves solving unsolvable problems. CCS is made up of a close-knit group of software and computer engineers with decades of experience. CCS stays at the leading edge of technology and creates customized software solutions for clients. 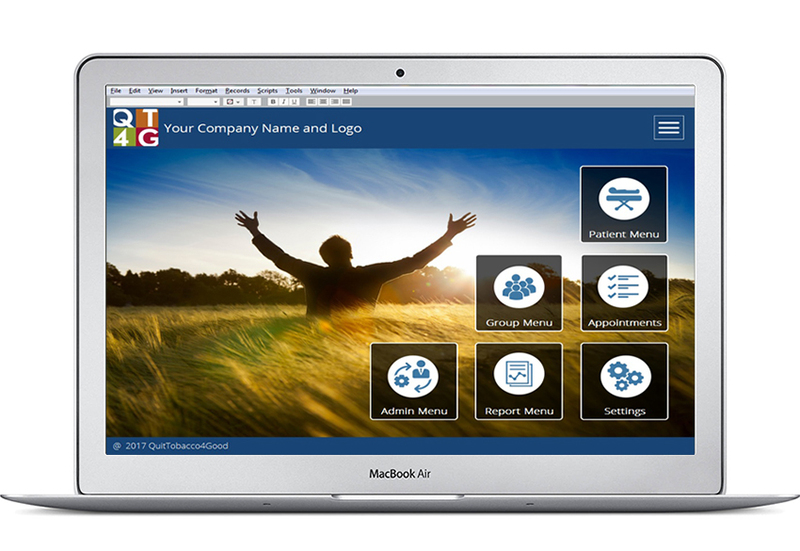 Customer satisfaction and partnering with major companies such as FileMaker and Apple, is CCS’s key to success. Please read this End User License Agreement ("Agreement") carefully before clicking the "I Agree" button, downloading or using Quit Tobacco for Good ("QT4Good"). By clicking the "I Agree" button, downloading or using QT4Good, you are agreeing to be bound by the terms and conditions of this Agreement. If you do not agree to the terms of this Agreement, do not click on the "I Agree" button and do not download or use QT4Good. License Customized Computer Solutions, LLC grants you a revocable, nonexclusive, nontransferable, limited license to download, install and use QT4Good strictly in accordance with the terms of this Agreement and the Pricing Plan selected. b) reverse engineer or otherwise copy or use QT4good in any manner whatsoever. All use of this license is limited to only the number of users permitted by the Pricing Plan selected. Modification Customized Computer Solutions LLC, retains the right in it’s sole discretion to modify, suspend or discontinue QT4Good. Should QT4Good be discontinued, Customized Computer Solutions LLC’s sole liability to you is a pro-rata refund of fees paid by you under the Pricing Plan selected. Term of license The term of this license is limited to the term of paid use under the Pricing Plan selected. Termination Your license to use QT4Good will terminate immediately, without prior notice from Customized Computer Solutions, LLC, in the event that you fail to comply with any provision of this Agreement or the Pricing Plan selected. Upon termination of this Agreement, you shall cease all use of QT4Good and delete all copies of QT4Good from all your desktops , laptops (mac's , pc's) and your mobile devices. Limitation of liability Customized Computer Solutions, LLC is not liable for any direct, indirect, consequential or other loss or damage including but not limited to damage to your computer system or data loss due to your use of QT4Good. Choice of Venue You and Customized Computer Solutions LLC agree that this Agreement is interpreted under and subject to the laws of the State of Mississippi and any claims or lawsuits shall be brought only in Hinds County Mississippi. Severability If any provision of this Agreement is held to be unenforceable or invalid, such provision will be changed and interpreted to accomplish the objectives of such provision to the greatest extent possible under applicable law and the remaining provisions will continue in full force and effect. Copyright © 2017 - Customized Computer Solutions. All Rights Reserved.